And thowing my hat in the "cheap" ring... I am expecting a Centaur derailleur, a cheap Torelli stem, two KMC chains, and a used KCNC 12-25 cassette to steal cogs from. damn... this thread is going to be BAAAAD! 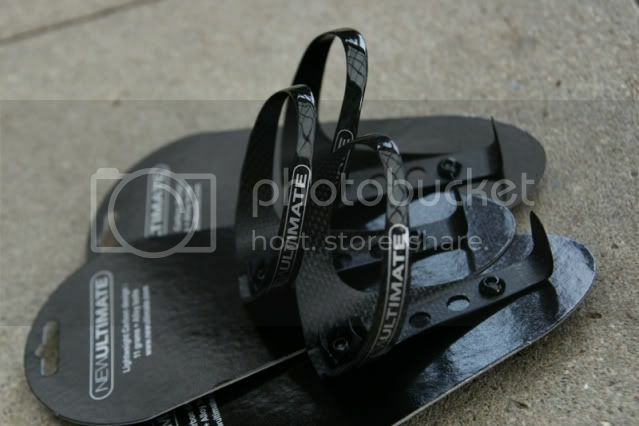 ... now I covet those new ultimate cages! "What have you seen here on weightweenies, had no idea you even wanted it let alone need it, and now have paid a nice hefty sum of money to have it"
"Look at the bike part... you are getting sleepy... when you wake up, you will realize you need to buy it"
"nanananana look at what I have that you don't - I know you want it"
Well, this thread is about a week too late for me...I've been calling Jason at FWB every week for the last 4 and melting plastic at an alarming rate, but this is a slow week. 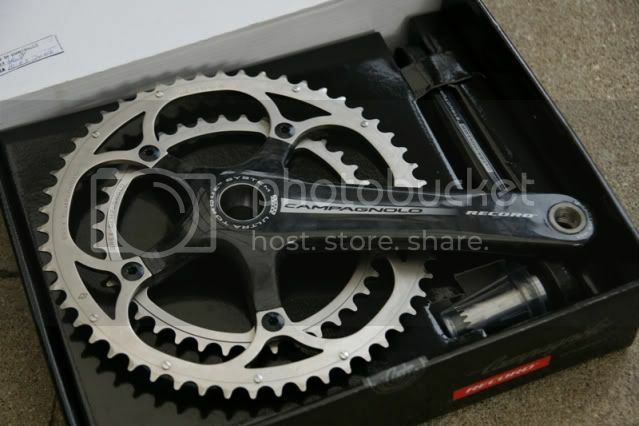 Today I ordered a 130 BCD 41 tooth Stronglight chainring from xxcycles (in Euros no less!) When it gets here it will be used with my 11-23 and 50tooth bigring to bring my gear range into perfect alignment with my fitness level and the weight of my bike. Howz that for justification? Last week: Black Nokons to replace my silver ones for more stealth, Tune AC14s (in black) to replace my aging Control Tech non-quick releases, a KMC SL (225g actual weight) and some Al bolts for my Cinelli RAM. Updated my bike to 10s and put new bar tape and cables while I was at it. ...and hopefully today: Catlike Whisper helmet(s) from München, if the store ordered them while I was visiting other areas. Edit: I should also add, a bit off topic, that I saw a Cervelo R3 SL built up with all sorts of "light" parts on it, including a Scalpula and full Red at Stadler, a mega-store in berlin, going for 7000Euro. It weight 5,4kg. Featured full carbon-everything, saddle, nokon, neg.g brakes, etc:. The works. I instantly thought: "that's it?! I can make it lighter." Loving them both, especially the shoes! Last edited by Murphs on Wed Aug 26, 2009 6:23 am, edited 1 time in total. Last edited by chickenkiev on Wed Aug 26, 2009 5:05 am, edited 1 time in total. Today I bought some Pro Bars, Whole Berry Blast. Organic, tasty but kind of pricy. 350 calories, 85 grams. 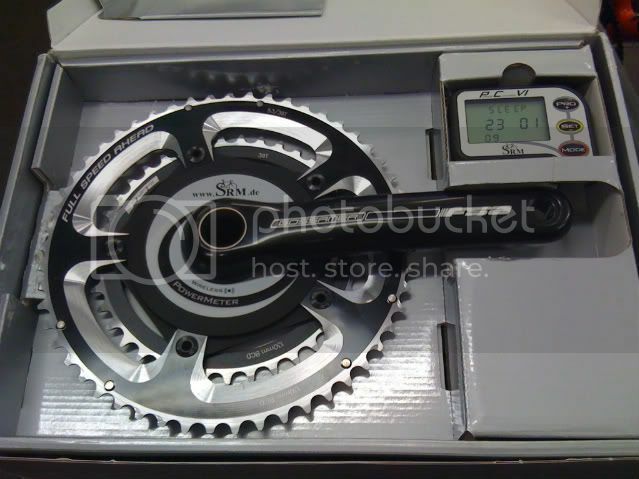 Last week I bought an SRM too! Does that count? It'll be a couple weeks before it arrives. Awaiting parts from Germany. Oh and yesterday I ordered 4 Pro3's from Wiggle. Been getting only 1200 miles on the rears. Doing too much climbing, I suppose. 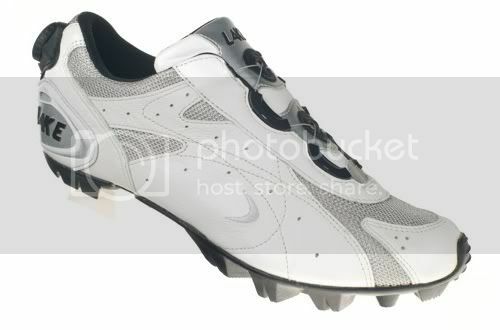 Not quite what I bought today but hopefully they should arrive today!! got my first flat today..